The SACIL Filter is an automatic backwashing system designed for the filtration of large flowrates of water with high concentration of contaminants. This filter is suitable for all water applications in which a filtration degree of 1mm or larger is required. The automatic cleaning by backwashing of the filtering elements does not require the interruption of the process flow and can be installed in-line with the pipeline. 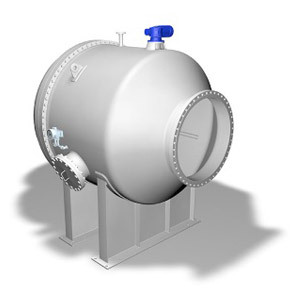 Customized to all pipe sizes and flange connections and designed with a compact inline solution and low weight. Vessels and Internals can be provided with all type of MOC, suitable for contact with water. The filtering element is a wheel subdivided in angular sectors by means of steel ribs. In-Line flanges for pipeline installation. By using differential pressure between Outlet line and Backwash discharge line, the sectors are cleaned by the reverse flow of filtered water drawn from the outside to the inside of the element. Backwash mechanism with a rotating wheel and a static arm. Suitable for all water applications including seawater and heating/cooling water.